It was when I thought you were completely mine….completely in my life. But yes, someone made you hers and that wasn’t me….u were in my life but I wasn’t. It was when I thought you had me in your heart….but it was already occupied….occupied by her. 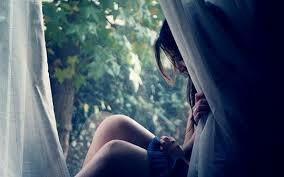 You said u loved me, but you *I love you” was followed by her name silently. You said you were listening carefully to my ideas…my thoughts, while she occupied all your thoughts. You said you with me always…. Yes you are, in my dreams. You asked me to wipe off my tears but your handkerchief was wet with her tears…. I was waiting for you….and you were waiting for her to come back to you. You kissed me….but you always wished it was her. You looked at me and smiled…I knew you thought bit was her. You hugged me…while holding her hand…. You defended your self by saying you are always with me….but deep down u wished she was with you….always. You held her hand when I needed your support. You looked at her when I called your name out. You laughed with her when I was sitting alone waiting for you….